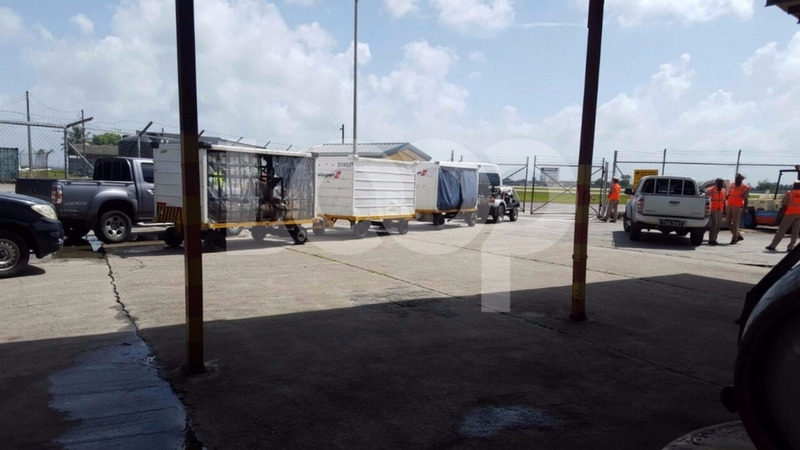 Christmas may very well be spent behind bars for the four people arrested in connection with the $5 million destined to Tobago for delivery to a commercial bank, which was stolen from an armoured security vehicle at the Piarco International Airport on December 6. The three men and woman were denied bail when they appeared before Magistrate Debby Ann Bassaw in the Arima 3rd Magistrates’ court today. 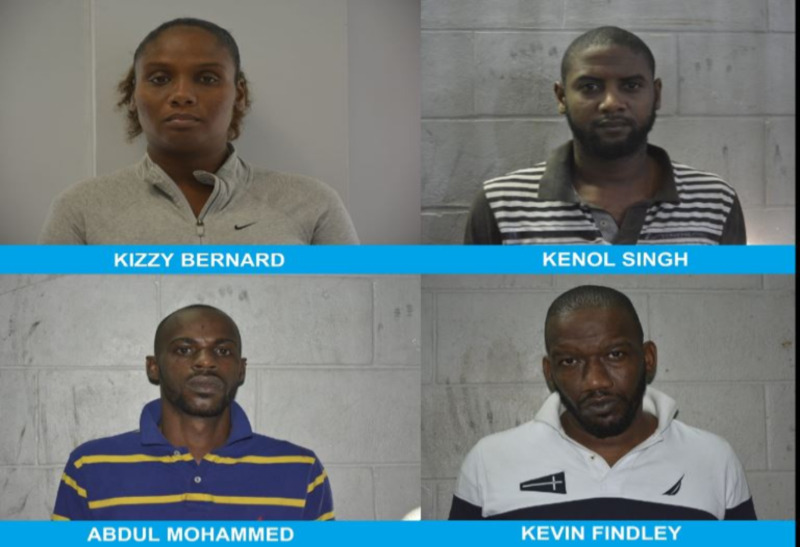 38-year-old Kizzy Bernard and her brother, 35-year-old labourer Kenol Singh, both of Longdenville Old Road, Chaguanas, are charged separately with money laundering while Bernard also faces a charge of receiving stolen money. Singh, 42-year-old Kevin Findley and 38-year-old Abdul Mohammed, both of Augustine Terrace, Diego Martin, are jointly charged with robbery with aggravation. Findley and Mohammed face an additional charge of possession of marijuana for the purpose of trafficking. This comes as Findely and Mohammed were arrested at their Diego Martin home on December 11, during which 1.3 kilogrammes of marijuana was found in their residence. The drug has an estimated street value of $13,000. Meanwhile, Bernard and Singh were arrested one day after the robbery on December 7 with $250,000 recovered in a vehicle that was driven by one of the accused in the Longdenville area. The robbery with aggravation matter against Singh, Findley and Mohammed was postponed to December 21 at the Arima Magistrates’ Court. The money laundering and receiving stolen money matters against Bernard and Singh were transferred to the Chaguanas Magistrates’ Court to be heard on December 19, while the possession of marijuana matter against Findley and Mohammed was transferred to the Port of Spain Magistrates’ Court, also to be heard tomorrow. All four were remanded into custody. The charges were laid by Acting ASP Mervyn Edwards of the Northern Division CID on Saturday after advice was received from acting Director of Public Prosecutions, Joan Honore-Paul, on that same day. The investigation was led by Acting Deputy Commissioner of Police in charge of Crime, Harold Phillip and was coordinated by Acting ACP for North West, Radcliffe Boxill and included Acting Snr Supt of the Northern Division, Michael Daniel; Acting Snr Supt, head of the Criminal Investigations Department Ajith Persad; Acting Supt Gary Edwards of the Organised Crime and Intelligence Unit; Inspector Nigel Birch and Sgt Shawn Ammon of Northern Division CID; Sgt. Anthony Williams of the Port of Spain CID and Cpl Marvin Pinder and W/Cpl Rachel Huggins, both of the Homicide Bureau of Investigations, Region 1, with support from the Central Division, Western Division, Fraud Squad, and Financial Investigations Bureau.